235685 6D125-1 KOMATSU Diesel Engine 6D125-1 Service(Shop) Manual. 235686 6D125-1A KOMATSU Diesel Engine 6D125-1A Spare parts catalog. 235687 6D125-1AB KOMATSU Diesel Engine 6D125-1AB Spare parts catalog. 235688 6D125-1AB-EW KOMATSU Diesel Engine6D125-1AB-EW Spare parts catalog. 235689 6D125-1AB-N KOMATSU Diesel Engine 6D125-1AB-N Spare parts catalog. 235690 6D125-1A-EA KOMATSU Diesel Engine 6D125-1A-EA Spare parts catalog. 235691 6D125-1AF KOMATSU Diesel Engine 6D125-1AF Spare parts catalog. 235692 6D125-1AF-EW KOMATSU Diesel Engine 6D125-1AF-EW Spare parts catalog. 235693 6D125-1AM KOMATSU Diesel Engine 6D125-1AM Spare parts catalog. 235694 6D125-1AM-EA KOMATSU Diesel Engine 6D125-1AM-EA Spare parts catalog. 235695 6D125-1AN KOMATSU Diesel Engine 6D125-1AN Spare parts catalog. 235696 6D125-1AN-EW KOMATSU Diesel Engine 6D125-1AN-EW Spare parts catalog. 235697 6D125-1B-EL KOMATSU Diesel Engine 6D125-1B-EL Spare parts catalog. 235698 6D125-1B-EP KOMATSU Diesel Engine 6D125-1B-EP Spare parts catalog. 235699 6D125-1B-P KOMATSU Diesel Engine 6D125-1B-P Spare parts catalog. 235700 6D125-1B-PL KOMATSU Diesel Engine 6D125-1B-PL Spare parts catalog. 235701 6D125-1C KOMATSU Diesel Engine 6D125-1C Spare parts catalog. 235702 6D125-1C-EA KOMATSU Diesel Engine 6D125-1C-EA Spare parts catalog. 235703 6D125-1D KOMATSU Diesel Engine6D125-1D Spare parts catalog. 235704 6D125-1DD KOMATSU Diesel Engine 6D125-1DD Spare parts catalog. 235705 6D125-1DD-EW KOMATSU Diesel Engine 6D125-1DD-EW Spare parts catalog. 235706 6D125-1D-EA KOMATSU Diesel Engine 6D125-1D-EA Spare parts catalog. 235707 6D125-1E KOMATSU Diesel Engine 6D125-1E Spare parts catalog. 235708 6D125-1EE KOMATSU Diesel Engine 6D125-1EE Spare parts catalog. 235709 6D125-1EE-EW KOMATSU Diesel Engine 6D125-1EE-EW Spare parts catalog. 235710 6D125-1F KOMATSU Diesel Engine 6D125-1F Spare parts catalog. 235711 6D125-1G KOMATSU Diesel Engine 6D125-1G Spare parts catalog. 235712 6D125-1G-EW KOMATSU Diesel Engine 6D125-1G-EW Spare parts catalog. 235713 6D125-1H KOMATSU Diesel Engine 6D125-1H Spare parts catalog. 235714 6D125-1J KOMATSU Diesel Engine 6D125-1J Spare parts catalog. 235715 6D125-1J-EA KOMATSU Diesel Engine 6D125-1J-EA Spare parts catalog. 235716 6D125-1K KOMATSU Diesel Engine 6D125-1K Spare parts catalog. 235717 6D125-1K-EA KOMATSU Diesel Engine6D125-1K-EA Spare parts catalog. 235718 6D125-1L KOMATSU Diesel Engine6D125-1L Spare parts catalog. 235719 6D125-1L-EW KOMATSU Diesel Engine 6D125-1L-EW Spare parts catalog. 235720 6D125-1M KOMATSU Diesel Engine 6D125-1M Spare parts catalog. 235721 6D125-1N KOMATSU Diesel Engine 6D125-1N Spare parts catalog. 235722 6D125-1Q KOMATSU Diesel Engine 6D125-1Q Spare parts catalog. 235723 6D125-1TT KOMATSU Diesel Engine 6D125-1TT Spare parts catalog. 235724 6D125-1TT-EM KOMATSU Diesel Engine 6D125-1TT-EM Spare parts catalog. 235725 6D125-1UU KOMATSU Diesel Engine6D125-1UU Spare parts catalog. 235726 6D125-1UU-EM KOMATSU Diesel Engine 6D125-1UU-EM Spare parts catalog. 235727 6D125-1VV KOMATSU Diesel Engine 6D125-1VV Spare parts catalog. 235728 6D125-1VV-EM KOMATSU Diesel Engine 6D125-1VV-EM Spare parts catalog. 235729 6D125-1W KOMATSU Diesel Engine 6D125-1W Spare parts catalog. 235730 6D125-1WW KOMATSU Diesel Engine 6D125-1WW Spare parts catalog. 235731 6D125-1X KOMATSU Diesel Engine 6D125-1X Spare parts catalog. 235732 6D125-1XX KOMATSU Diesel Engine 6D125-1XX Spare parts catalog. 235733 6D125-1XX-B KOMATSU Diesel Engine6D125-1XX-B Spare parts catalog. 235734 6D125-1Y KOMATSU Diesel Engine 6D125-1Y Spare parts catalog. 235735 6D125-1YY KOMATSU Diesel Engine 6D125-1YY Spare parts catalog. 235736 6D125-1Z KOMATSU Diesel Engine 6D125-1Z Spare parts catalog. 235737 6D125-1Z-EW KOMATSU Diesel Engine 6D125-1Z-EW Spare parts catalog. 235738 6D125-1ZZ KOMATSU Diesel Engine 6D125-1ZZ Spare parts catalog. 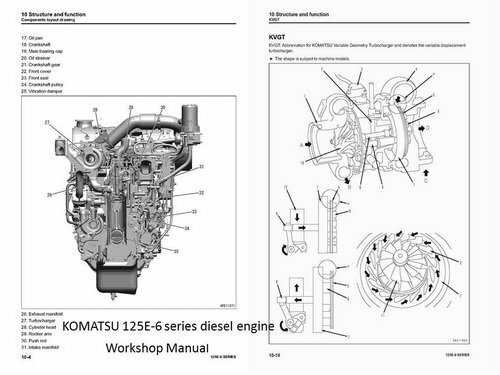 235739 6D125-2 KOMATSU Diesel Engine 6D125-2 Service(Shop) Manual. 235740 6D125E-2 KOMATSU Diesel Engine 6D125E-2 Service(Shop) Manual. 235741 6D125E-2A KOMATSU Diesel Engine 6D125E-2A Spare parts catalog. 235742 6D125E-2A-40 KOMATSU Diesel Engine 6D125E-2A-40 Spare parts catalog. 235743 6D125E-2A-45 KOMATSU Diesel Engine 6D125E-2A-45 Spare parts catalog. 235744 6D125E-2A-5 KOMATSU Diesel Engine 6D125E-2A-5 Spare parts catalog. 235745 6D125E-2B-5 KOMATSU Diesel Engine 6D125E-2B-5 Spare parts catalog. 235746 6D125E-2D KOMATSU Diesel Engine 6D125E-2D Spare parts catalog. 235747 6D125E-2D-5 KOMATSU Diesel Engine6D125E-2D-5 Spare parts catalog. 235748 6D125E-2E KOMATSU Diesel Engine 6D125E-2E Spare parts catalog. 235749 6D125E-2E-5 KOMATSU Diesel Engine 6D125E-2E-5 Spare parts catalog. 235750 6D125E-2F-5 KOMATSU Diesel Engine 6D125E-2F-5 Spare parts catalog. 235751 6D125E-2G KOMATSU Diesel Engine 6D125E-2G Spare parts catalog. 235752 6D125E-2G-5 KOMATSU Diesel Engine 6D125E-2G-5 Spare parts catalog. 235753 6D125E-2H KOMATSU Diesel Engine 6D125E-2H Spare parts catalog. 235754 6D125E-2H-5 KOMATSU Diesel Engine 6D125E-2H-5 Spare parts catalog. 235755 6D125E-2J-5 KOMATSU Diesel Engine 6D125E-2J-5 Spare parts catalog. 235756 6D125E-2J-S5 KOMATSU Diesel Engine 6D125E-2J-S5 Spare parts catalog. 235757 6D125E-3 KOMATSU Diesel Engine 6D125E-3 Service(Shop) Manual. 235758 6D125E-5 KOMATSU Diesel Engine 6D125E-5 Service(Shop) Manual. 235759 G.SA6D125-1 KOMATSU Diesel Engine G.SA6D125-1 Spare parts catalog. 235760 G-6D125-1G3-X4 KOMATSU Diesel Engine G-6D125-1G3-X4 Spare parts catalog. 235761 G-6D125-1GD-D1 KOMATSU Diesel Engine G-6D125-1GD-D1 Spare parts catalog. 235762 G-S6D125-1G2-50 KOMATSU Diesel EngineG-S6D125-1G2-50 Spare parts catalog. 235763 G-S6D125-1G2-E4 KOMATSU Diesel Engine G-S6D125-1G2-E4 Spare parts catalog. 235764 G-S6D125-1G2-E5 KOMATSU Diesel Engine G-S6D125-1G2-E5 Spare parts catalog. 235765 G-S6D125-1G2-F2 KOMATSU Diesel Engine G-S6D125-1G2-F2 Spare parts catalog. 235766 G-S6D125-1GD-01 KOMATSU Diesel Engine G-S6D125-1GD-01 Spare parts catalog. 235767 G-S6D125-1GD-F6 KOMATSU Diesel Engine G-S6D125-1GD-F6 Spare parts catalog. 235768 G-S6D125-1GD-F7 KOMATSU Diesel EngineG-S6D125-1GD-F7 Spare parts catalog. 235769 G-S6D125-1GD-F8 KOMATSU Diesel Engine G-S6D125-1GD-F8 Spare parts catalog. 235770 G-S6D125-1GD-F9 KOMATSU Diesel Engine G-S6D125-1GD-F9 Spare parts catalog. 235771 G-S6D125-1GD-G1 KOMATSU Diesel Engine G-S6D125-1GD-G1 Spare parts catalog. 235772 G-S6D125-1GD-G2 KOMATSU Diesel Engine G-S6D125-1GD-G2 Spare parts catalog. 235773 G-S6D125-1GD-G5 KOMATSU Diesel Engine G-S6D125-1GD-G5 Spare parts catalog. 235774 G-S6D125-1GD-G6 KOMATSU Diesel Engine G-S6D125-1GD-G6 Spare parts catalog. 235775 G-S6D125-1GD-G7 KOMATSU Diesel Engine G-S6D125-1GD-G7 Spare parts catalog. 235776 G-S6D125-1GD-G8 KOMATSU Diesel Engine G-S6D125-1GD-G8 Spare parts catalog. 235777 G-S6D125-1GD-G9 KOMATSU Diesel Engine G-S6D125-1GD-G9 Spare parts catalog. 235778 G-S6D125-1GD-H1 KOMATSU Diesel Engine G-S6D125-1GD-H1 Spare parts catalog. 235779 G-SA6D125-1G2-D7 KOMATSU Diesel Engine G-SA6D125-1G2-D7 Spare parts catalog. 235780 G-SA6D125-1G2-D8 KOMATSU Diesel Engine G-SA6D125-1G2-D8 Spare parts catalog. 235781 G-SA6D125-1G2-E5 KOMATSU Diesel Engine G-SA6D125-1G2-E5 Spare parts catalog. 235782 G-SA6D125-1G2-E6 KOMATSU Diesel EngineG-SA6D125-1G2-E6 Spare parts catalog. 235783 G-SA6D125-1G3-V1 KOMATSU Diesel Engine G-SA6D125-1G3-V1 Spare parts catalog. 235784 G-SA6D125-1G3-V4 KOMATSU Diesel Engine G-SA6D125-1G3-V4 Spare parts catalog. 235785 G-SA6D125-1G3-V7 KOMATSU Diesel Engine G-SA6D125-1G3-V7 Spare parts catalog. 235786 G-SA6D125-1G3-V8 KOMATSU Diesel Engine G-SA6D125-1G3-V8 Spare parts catalog. 235787 G-SA6D125-1G3-X1 KOMATSU Diesel Engine G-SA6D125-1G3-X1 Spare parts catalog. 235788 G-SA6D125-1G3-X2 KOMATSU Diesel Engine G-SA6D125-1G3-X2 Spare parts catalog. 235789 G-SA6D125-1G3-X3 KOMATSU Diesel Engine G-SA6D125-1G3-X3 Spare parts catalog. 235790 G-SA6D125-1G3-X4 KOMATSU Diesel Engine G-SA6D125-1G3-X4 Spare parts catalog. 235791 G-SA6D125-1G3-X5 KOMATSU Diesel Engine G-SA6D125-1G3-X5 Spare parts catalog. 235792 G-SA6D125-1GD-E7 KOMATSU Diesel Engine G-SA6D125-1GD-E7 Spare parts catalog. 235793 G-SA6D125-1GD-E8 KOMATSU Diesel Engine G-SA6D125-1GD-E8 Spare parts catalog. 235794 G-SA6D125-1GD-E9 KOMATSU Diesel EngineG-SA6D125-1GD-E9 Spare parts catalog. 235795 G-SA6D125-1GD-F1 KOMATSU Diesel Engine G-SA6D125-1GD-F1 Spare parts catalog. 235796 G-SA6D125-1GD-F3 KOMATSU Diesel Engine G-SA6D125-1GD-F3 Spare parts catalog. 235797 G-SA6D125-1GD-F4 KOMATSU Diesel Engine G-SA6D125-1GD-F4 Spare parts catalog. 235798 G-SA6D125-1GD-F5 KOMATSU Diesel Engine G-SA6D125-1GD-F5 Spare parts catalog. 235799 G-SA6D125-1GD-F6 KOMATSU Diesel Engine G-SA6D125-1GD-F6 Spare parts catalog. 235800 G-SA6D125-1GD-F7 KOMATSU Diesel Engine G-SA6D125-1GD-F7 Spare parts catalog. 235801 G-SA6D125-1GD-F8 KOMATSU Diesel Engine G-SA6D125-1GD-F8 Spare parts catalog. 235802 G-SA6D125-1GD-F9 KOMATSU Diesel Engine G-SA6D125-1GD-F9 Spare parts catalog. 235803 S6D125-1 KOMATSU Diesel Engine S6D125-1 Service(Shop) Manual. 235804 S6D125-1AD KOMATSU Diesel Engine S6D125-1AD Spare parts catalog. 235805 S6D125-1AD-FA KOMATSU Diesel Engine S6D125-1AD-FA Spare parts catalog. 235806 S6D125-1AF KOMATSU Diesel Engine S6D125-1AF Spare parts catalog. 235807 S6D125-1AF-FM KOMATSU Diesel Engine S6D125-1AF-FM Spare parts catalog. 235808 S6D125-1AG KOMATSU Diesel Engine S6D125-1AG Spare parts catalog. 235809 S6D125-1AG-FA KOMATSU Diesel Engine S6D125-1AG-FA Spare parts catalog. 235810 S6D125-1AG-FT KOMATSU Diesel Engine S6D125-1AG-FT Spare parts catalog. 235811 S6D125-1AG-T KOMATSU Diesel EngineS6D125-1AG-T Spare parts catalog. 235812 S6D125-1AH KOMATSU Diesel Engine S6D125-1AH Spare parts catalog. 235813 S6D125-1AH-FA KOMATSU Diesel Engine S6D125-1AH-FA Spare parts catalog. 235814 S6D125-1AJ-FH KOMATSU Diesel Engine S6D125-1AJ-FH Spare parts catalog. 235815 S6D125-1AJ-FS KOMATSU Diesel Engine S6D125-1AJ-FS Spare parts catalog. 235816 S6D125-1AJ-FT KOMATSU Diesel Engine S6D125-1AJ-FT Spare parts catalog. 235817 S6D125-1AJ-H KOMATSU Diesel Engine S6D125-1AJ-H Spare parts catalog. 235818 S6D125-1AJ-S KOMATSU Diesel Engine S6D125-1AJ-S Spare parts catalog. 235819 S6D125-1AJ-TN KOMATSU Diesel Engine S6D125-1AJ-TN Spare parts catalog. 235820 S6D125-1AK KOMATSU Diesel Engine S6D125-1AK Spare parts catalog. 235821 S6D125-1AK-FW KOMATSU Diesel Engine S6D125-1AK-FW Spare parts catalog. 235822 S6D125-1AL KOMATSU Diesel Engine S6D125-1AL Spare parts catalog. 235823 S6D125-1AL-FW KOMATSU Diesel Engine S6D125-1AL-FW Spare parts catalog. 235824 S6D125-1AM KOMATSU Diesel Engine S6D125-1AM Spare parts catalog. 235825 S6D125-1AM-FW KOMATSU Diesel Engine S6D125-1AM-FW Spare parts catalog. 235826 S6D125-1B8 KOMATSU Diesel Engine S6D125-1B8 Spare parts catalog. 235827 S6D125-1B8-FA KOMATSU Diesel Engine S6D125-1B8-FA Spare parts catalog. 235828 S6D125-1C KOMATSU Diesel Engine S6D125-1C Spare parts catalog. 235829 S6D125-1CC KOMATSU Diesel Engine S6D125-1CC Spare parts catalog. 235830 S6D125-1CC-C KOMATSU Diesel Engine S6D125-1CC-C Spare parts catalog. 235831 S6D125-1CC-FC KOMATSU Diesel Engine S6D125-1CC-FC Spare parts catalog. 235832 S6D125-1CC-FW KOMATSU Diesel Engine S6D125-1CC-FW Spare parts catalog. 235833 S6D125-1C-FW KOMATSU Diesel Engine S6D125-1C-FW Spare parts catalog. 235834 S6D125-1D KOMATSU Diesel Engine S6D125-1D Spare parts catalog. 235835 S6D125-1D-AR KOMATSU Diesel Engine S6D125-1D-AR Spare parts catalog. 235836 S6D125-1D-FE KOMATSU Diesel EngineS6D125-1D-FE Spare parts catalog. 235837 S6D125-1D-FM KOMATSU Diesel Engine S6D125-1D-FM Spare parts catalog. 235838 S6D125-1E KOMATSU Diesel Engine S6D125-1E Spare parts catalog. 235839 S6D125-1EE KOMATSU Diesel Engine S6D125-1EE Spare parts catalog. 235840 S6D125-1EE-FW KOMATSU Diesel Engine S6D125-1EE-FW Spare parts catalog. 235841 S6D125-1E-FA KOMATSU Diesel Engine S6D125-1E-FA Spare parts catalog. 235842 S6D125-1F KOMATSU Diesel Engine S6D125-1F Spare parts catalog. 235843 S6D125-1FF KOMATSU Diesel Engine S6D125-1FF Spare parts catalog. 235844 S6D125-1JJ KOMATSU Diesel Engine S6D125-1JJ Spare parts catalog. 235845 S6D125-1JJ-FA KOMATSU Diesel Engine S6D125-1JJ-FA Spare parts catalog. 235846 S6D125-1K KOMATSU Diesel Engine S6D125-1K Spare parts catalog. 235847 S6D125-1KK KOMATSU Diesel Engine S6D125-1KK Spare parts catalog. 235848 S6D125-1KK-FW KOMATSU Diesel Engine S6D125-1KK-FW Spare parts catalog. 235849 S6D125-1L KOMATSU Diesel Engine S6D125-1L Spare parts catalog. 235850 S6D125-1M KOMATSU Diesel Engine S6D125-1M Spare parts catalog. 235851 S6D125-1M-FA KOMATSU Diesel Engine S6D125-1M-FA Spare parts catalog. 235852 S6D125-1N KOMATSU Diesel Engine S6D125-1N Spare parts catalog. 235853 S6D125-1P KOMATSU Diesel Engine S6D125-1P Spare parts catalog. 235854 S6D125-1PP-B KOMATSU Diesel Engine S6D125-1PP-B Spare parts catalog. 235855 S6D125-1Q KOMATSU Diesel Engine S6D125-1Q Spare parts catalog. 235856 S6D125-1QQ KOMATSU Diesel Engine S6D125-1QQ Spare parts catalog. 235857 S6D125-1QQ-FA KOMATSU Diesel Engine S6D125-1QQ-FA Spare parts catalog. 235858 S6D125-1R KOMATSU Diesel Engine S6D125-1R Spare parts catalog. 235859 S6D125-1R-FA KOMATSU Diesel Engine S6D125-1R-FA Spare parts catalog. 235860 S6D125-1S KOMATSU Diesel Engine S6D125-1S Spare parts catalog. 235861 S6D125-1S-FA KOMATSU Diesel Engine S6D125-1S-FA Spare parts catalog. 235862 S6D125-1T KOMATSU Diesel Engine S6D125-1T Spare parts catalog. 235863 S6D125-1TT KOMATSU Diesel Engine S6D125-1TT Spare parts catalog. 235864 S6D125-1TT-FA KOMATSU Diesel Engine S6D125-1TT-FA Spare parts catalog. 235865 S6D125-1VV KOMATSU Diesel Engine S6D125-1VV Spare parts catalog. 235866 S6D125-1VV-C KOMATSU Diesel Engine S6D125-1VV-C Spare parts catalog. 235867 S6D125-1VV-FA KOMATSU Diesel Engine S6D125-1VV-FA Spare parts catalog. 235868 S6D125-1VV-FC KOMATSU Diesel Engine S6D125-1VV-FC Spare parts catalog. 235869 S6D125-1VV-FK KOMATSU Diesel Engine S6D125-1VV-FK Spare parts catalog. 235870 S6D125-1VV-FR KOMATSU Diesel Engine S6D125-1VV-FR Spare parts catalog. 235871 S6D125-1VV-FT KOMATSU Diesel Engine S6D125-1VV-FT Spare parts catalog. 235872 S6D125-1VV-K KOMATSU Diesel Engine S6D125-1VV-K Spare parts catalog. 235873 S6D125-1VV-R KOMATSU Diesel Engine S6D125-1VV-R Spare parts catalog. 235874 S6D125-1VV-T KOMATSU Diesel Engine S6D125-1VV-T Spare parts catalog. 235875 S6D125-1X KOMATSU Diesel Engine S6D125-1X Spare parts catalog. 235876 S6D125-1XX KOMATSU Diesel Engine S6D125-1XX Spare parts catalog. 235877 S6D125-1XX-FA KOMATSU Diesel Engine S6D125-1XX-FA Spare parts catalog. 235878 S6D125-1Y-B KOMATSU Diesel Engine S6D125-1Y-B Spare parts catalog. 235879 S6D125-1Z KOMATSU Diesel Engine S6D125-1Z Spare parts catalog. 235880 S6D125-2 KOMATSU Diesel Engine S6D125-2 Service(Shop) Manual. 235881 S6D125E-2A KOMATSU Diesel Engine S6D125E-2A Spare parts catalog. 235882 S6D125E-2A-6 KOMATSU Diesel Engine S6D125E-2A-6 Spare parts catalog. 235883 S6D125E-2B-6 KOMATSU Diesel Engine S6D125E-2B-6 Spare parts catalog. 235884 S6D125E-2C KOMATSU Diesel EngineS6D125E-2C Spare parts catalog. 235885 S6D125E-2C-6 KOMATSU Diesel Engine S6D125E-2C-6 Spare parts catalog. 235886 S6D125E-2D KOMATSU Diesel Engine S6D125E-2D Spare parts catalog. 235887 S6D125E-2D-6 KOMATSU Diesel Engine S6D125E-2D-6 Spare parts catalog. 235888 S6D125E-2E KOMATSU Diesel Engine S6D125E-2E Spare parts catalog. 235889 S6D125E-2E-6 KOMATSU Diesel Engine S6D125E-2E-6 Spare parts catalog. 235890 S6D125E-2F KOMATSU Diesel Engine S6D125E-2F Spare parts catalog. 235891 S6D125E-2F-50 KOMATSU Diesel Engine S6D125E-2F-50 Spare parts catalog. 235892 S6D125E-2F-56 KOMATSU Diesel Engine S6D125E-2F-56 Spare parts catalog. 235893 S6D125E-2F-6 KOMATSU Diesel Engine S6D125E-2F-6 Spare parts catalog. 235894 S6D125E-2G KOMATSU Diesel Engine S6D125E-2G Spare parts catalog. 235895 S6D125E-2G-6 KOMATSU Diesel Engine S6D125E-2G-6 Spare parts catalog. 235896 S6D125E-2GD-D8 KOMATSU Diesel Engine S6D125E-2GD-D8 Spare parts catalog. 235897 S6D125E-2H KOMATSU Diesel Engine S6D125E-2H Spare parts catalog. 235898 S6D125E-2H-6 KOMATSU Diesel Engine S6D125E-2H-6 Spare parts catalog. 235899 S6D125E-2J KOMATSU Diesel Engine S6D125E-2J Spare parts catalog. 235900 S6D125E-2J-6 KOMATSU Diesel Engine S6D125E-2J-6 Spare parts catalog. 235901 S6D125E-2K-6 KOMATSU Diesel Engine S6D125E-2K-6 Spare parts catalog. 235902 S6D125E-2L KOMATSU Diesel Engine S6D125E-2L Spare parts catalog. 235903 S6D125E-2L-6 KOMATSU Diesel Engine S6D125E-2L-6 Spare parts catalog. 235904 S6D125E-2M-6 KOMATSU Diesel Engine S6D125E-2M-6 Spare parts catalog. 235905 SA6D125-1 KOMATSU Diesel Engine SA6D125-1 Service(Shop) Manual. 235906 SA6D125-1AA KOMATSU Diesel Engine SA6D125-1AA Spare parts catalog. 235907 SA6D125-1G KOMATSU Diesel Engine SA6D125-1G Spare parts catalog. 235908 SA6D125-1GD-F5 KOMATSU Diesel EngineSA6D125-1GD-F5 Spare parts catalog. 235909 SA6D125-1GD-F6 KOMATSU Diesel Engine SA6D125-1GD-F6 Spare parts catalog. 235910 SA6D125-1GD-F7 KOMATSU Diesel Engine SA6D125-1GD-F7 Spare parts catalog. 235911 SA6D125-1HH KOMATSU Diesel EngineSA6D125-1HH Spare parts catalog. 235912 SA6D125-1Q KOMATSU Diesel Engine SA6D125-1Q Spare parts catalog. 235913 SA6D125-1S KOMATSU Diesel Engine SA6D125-1S Spare parts catalog. 235914 SA6D125-1T KOMATSU Diesel Engine SA6D125-1T Spare parts catalog. 235915 SA6D125-1X KOMATSU Diesel Engine SA6D125-1X Spare parts catalog. 235916 SA6D125-1X-GA KOMATSU Diesel EngineSA6D125-1X-GA Spare parts catalog. 235917 SA6D125-1Z KOMATSU Diesel Engine SA6D125-1Z Spare parts catalog. 235918 SA6D125-2 KOMATSU Diesel Engine SA6D125-2 Service(Shop) Manual. 235919 SA6D125E-2A KOMATSU Diesel Engine SA6D125E-2A Spare parts catalog. 235920 SA6D125E-2A-50 KOMATSU Diesel Engine SA6D125E-2A-50 Spare parts catalog. 235921 SA6D125E-2A-57 KOMATSU Diesel Engine SA6D125E-2A-57 Spare parts catalog. 235922 SA6D125E-2A-7 KOMATSU Diesel Engine SA6D125E-2A-7 Spare parts catalog. 235923 SA6D125E-2A-C KOMATSU Diesel Engine SA6D125E-2A-C Spare parts catalog. 235924 SA6D125E-2A-C7 KOMATSU Diesel Engine SA6D125E-2A-C7 Spare parts catalog. 235925 SA6D125E-2A-K7 KOMATSU Diesel Engine SA6D125E-2A-K7 Spare parts catalog. 235926 SA6D125E-2A-KU KOMATSU Diesel Engine SA6D125E-2A-KU Spare parts catalog. 235927 SA6D125E-2B-7 KOMATSU Diesel Engine SA6D125E-2B-7 Spare parts catalog. 235928 SA6D125E-2C-H7 KOMATSU Diesel Engine SA6D125E-2C-H7 Spare parts catalog. 235929 SA6D125E-2C-L KOMATSU Diesel Engine SA6D125E-2C-L Spare parts catalog. 235930 SA6D125E-2C-L7 KOMATSU Diesel EngineSA6D125E-2C-L7 Spare parts catalog. 235931 SA6D125E-2C-S KOMATSU Diesel Engine SA6D125E-2C-S Spare parts catalog. 235932 SA6D125E-2C-S7 KOMATSU Diesel EngineSA6D125E-2C-S7 Spare parts catalog. 235933 SA6D125E-2C-T7 KOMATSU Diesel Engine SA6D125E-2C-T7 Spare parts catalog. 235934 SA6D125E-2C-TA KOMATSU Diesel Engine SA6D125E-2C-TA Spare parts catalog. 235935 SA6D125E-2CT-T7 KOMATSU Diesel Engine SA6D125E-2CT-T7 Spare parts catalog. 235936 SA6D125E-2E-7 KOMATSU Diesel Engine SA6D125E-2E-7 Spare parts catalog. 235937 SA6D125E-2G KOMATSU Diesel Engine SA6D125E-2G Spare parts catalog. 235938 SA6D125E-2G-7 KOMATSU Diesel Engine SA6D125E-2G-7 Spare parts catalog. 235939 SA6D125E-2GD-E KOMATSU Diesel Engine SA6D125E-2GD-E Spare parts catalog. 235940 SA6D125E-2GD-W KOMATSU Diesel Engine SA6D125E-2GD-W Spare parts catalog. 235941 SA6D125E-2GD-W7 KOMATSU Diesel Engine SA6D125E-2GD-W7 Spare parts catalog. 235942 SA6D125E-2L KOMATSU Diesel Engine SA6D125E-2L Spare parts catalog. 235943 SA6D125E-2L-7 KOMATSU Diesel Engine SA6D125E-2L-7 Spare parts catalog. 235944 SA6D125E-2U-B7 KOMATSU Diesel Engine SA6D125E-2U-B7 Spare parts catalog. 235945 SA6D125E-2V-7 KOMATSU Diesel Engine SA6D125E-2V-7 Spare parts catalog. 235946 SA6D125E-3 KOMATSU Diesel Engine SA6D125E-3 Service(Shop) Manual. 235947 SA6D125E-3A-7W KOMATSU Diesel Engine SA6D125E-3A-7W Spare parts catalog. 235948 SA6D125E-3B-7 KOMATSU Diesel Engine SA6D125E-3B-7 Spare parts catalog. 235949 SA6D125E-3C-7A KOMATSU Diesel Engine SA6D125E-3C-7A Spare parts catalog. 235950 SA6D125E-3C-7L KOMATSU Diesel Engine SA6D125E-3C-7L Spare parts catalog. 235951 SA6D125E-3C-7T KOMATSU Diesel Engine SA6D125E-3C-7T Spare parts catalog. 235952 SA6D125E-3D KOMATSU Diesel Engine SA6D125E-3D Spare parts catalog. 235953 SA6D125E-3D-MS KOMATSU Diesel Engine SA6D125E-3D-MS Spare parts catalog. 235954 SA6D125E-GD-2-E1 KOMATSU Diesel Engine SA6D125E-GD-2-E1 Spare parts catalog. 235955 SA6D125-G1-1-H1 KOMATSU Diesel Engine SA6D125-G1-1-H1 Spare parts catalog. 235956 SAA6D125-2 KOMATSU Diesel Engine SAA6D125-2 Service(Shop) Manual. 235957 SAA6D125E-2B KOMATSU Diesel Engine SAA6D125E-2B Spare parts catalog. 235958 SAA6D125E-2B-8 KOMATSU Diesel Engine SAA6D125E-2B-8 Spare parts catalog. 235959 SAA6D125E-2C KOMATSU Diesel Engine SAA6D125E-2C Spare parts catalog. 235960 SAA6D125E-2C-8 KOMATSU Diesel Engine SAA6D125E-2C-8 Spare parts catalog. 235961 SAA6D125E-2D KOMATSU Diesel Engine SAA6D125E-2D Spare parts catalog. 235962 SAA6D125E-2-D2 KOMATSU Diesel Engine SAA6D125E-2-D2 Spare parts catalog. 235963 SAA6D125E-2D-8 KOMATSU Diesel Engine SAA6D125E-2D-8 Spare parts catalog. 235964 SAA6D125E-2F-8 KOMATSU Diesel Engine SAA6D125E-2F-8 Spare parts catalog. 235965 SAA6D125E-3 KOMATSU Diesel EngineSAA6D125E-3 Service(Shop) Manual. 235966 SAA6D125E-3 KOMATSU Diesel Engine SAA6D125E-3 Spare parts catalog. 235967 SAA6D125E-3A KOMATSU Diesel Engine SAA6D125E-3A Spare parts catalog. 235968 SAA6D125E-3A-8M KOMATSU Diesel Engine SAA6D125E-3A-8M Spare parts catalog. 235969 SAA6D125E-3A-8W KOMATSU Diesel Engine SAA6D125E-3A-8W Spare parts catalog. 235970 SAA6D125E-3B KOMATSU Diesel Engine SAA6D125E-3B Spare parts catalog. 235971 SAA6D125E-3B-8M KOMATSU Diesel Engine SAA6D125E-3B-8M Spare parts catalog. 235972 SAA6D125E-3B-8W KOMATSU Diesel Engine SAA6D125E-3B-8W Spare parts catalog. 235973 SAA6D125E-3G-8M KOMATSU Diesel EngineSAA6D125E-3G-8M Spare parts catalog. 235974 SAA6D125E-3G-8W KOMATSU Diesel Engine SAA6D125E-3G-8W Spare parts catalog. 235975 SAA6D125E-3H-8M KOMATSU Diesel Engine SAA6D125E-3H-8M Spare parts catalog. 235976 SAA6D125E-3K KOMATSU Diesel EngineSAA6D125E-3K Spare parts catalog. 235977 SAA6D125E-3K-8K KOMATSU Diesel Engine SAA6D125E-3K-8K Spare parts catalog. 235978 SAA6D125E-3K-8M KOMATSU Diesel Engine SAA6D125E-3K-8M Spare parts catalog. 235979 SAA6D125E-3K-8W KOMATSU Diesel Engine SAA6D125E-3K-8W Spare parts catalog. 235980 SAA6D125E-3L-8A KOMATSU Diesel Engine SAA6D125E-3L-8A Spare parts catalog. 235981 SAA6D125E-3M-8M KOMATSU Diesel Engine SAA6D125E-3M-8M Spare parts catalog. 235982 SAA6D125E-3N-8M KOMATSU Diesel Engine SAA6D125E-3N-8M Spare parts catalog. 235983 SAA6D125E-5 KOMATSU Diesel Engine SAA6D125E-5 Service(Shop) Manual. 235984 SAA6D125E-5 KOMATSU Diesel Engine SAA6D125E-5 Spare parts catalog. 235985 SAA6D125E-5A KOMATSU Diesel Engine SAA6D125E-5A Spare parts catalog. 235986 SAA6D125E-5A-01 KOMATSU Diesel Engine SAA6D125E-5A-01 Spare parts catalog. 235987 SAA6D125E-5A-02 KOMATSU Diesel Engine SAA6D125E-5A-02 Spare parts catalog. 235988 SAA6D125E-5B KOMATSU Diesel Engine SAA6D125E-5B Spare parts catalog. 235989 SAA6D125E-5B-01 KOMATSU Diesel Engine SAA6D125E-5B-01 Spare parts catalog. 235990 SAA6D125E-5B-02 KOMATSU Diesel Engine SAA6D125E-5B-02 Spare parts catalog. 235991 SAA6D125E-5BA KOMATSU Diesel EngineSAA6D125E-5BA Spare parts catalog. 235992 SAA6D125E-5BR-W KOMATSU Diesel Engine SAA6D125E-5BR-W Spare parts catalog. 235993 SAA6D125E-5C KOMATSU Diesel Engine SAA6D125E-5C Spare parts catalog. 235994 SAA6D125E-5C-01 KOMATSU Diesel Engine SAA6D125E-5C-01 Spare parts catalog. 235995 SAA6D125E-5C-02 KOMATSU Diesel Engine SAA6D125E-5C-02 Spare parts catalog. 235996 SAA6D125E-5CR KOMATSU Diesel Engine SAA6D125E-5CR Spare parts catalog. 235997 SAA6D125E-5CR-W KOMATSU Diesel Engine SAA6D125E-5CR-W Spare parts catalog. 235998 SAA6D125E-5D KOMATSU Diesel Engine SAA6D125E-5D Spare parts catalog. 235999 SAA6D125E-5D-01 KOMATSU Diesel Engine SAA6D125E-5D-01 Spare parts catalog. 236000 SAA6D125E-5D-02 KOMATSU Diesel Engine SAA6D125E-5D-02 Spare parts catalog. 236001 SAA6D125E-5E KOMATSU Diesel Engine SAA6D125E-5E Spare parts catalog. 236002 SAA6D125E-5E-01 KOMATSU Diesel Engine SAA6D125E-5E-01 Spare parts catalog. 236003 SAA6D125E-5E-02 KOMATSU Diesel Engine SAA6D125E-5E-02 Spare parts catalog. 236004 SAA6D125E-5F KOMATSU Diesel Engine SAA6D125E-5F Spare parts catalog. 236005 SAA6D125E-5F-01 KOMATSU Diesel Engine SAA6D125E-5F-01 Spare parts catalog. 236006 SAA6D125E-5F-02 KOMATSU Diesel Engine SAA6D125E-5F-02 Spare parts catalog. 236007 SAA6D125E-5-FR KOMATSU Diesel Engine SAA6D125E-5-FR Spare parts catalog. 236008 SAA6D125E-5G KOMATSU Diesel Engine SAA6D125E-5G Spare parts catalog. 236009 SAA6D125E-5G-01 KOMATSU Diesel Engine SAA6D125E-5G-01 Spare parts catalog. 236010 SAA6D125E-5G-02 KOMATSU Diesel Engine SAA6D125E-5G-02 Spare parts catalog. 236011 SAA6D125E-5H KOMATSU Diesel EngineSAA6D125E-5H Spare parts catalog. 236012 SAA6D125E-5J KOMATSU Diesel Engine SAA6D125E-5J Spare parts catalog. 236013 SAA6D125E-6 KOMATSU Diesel Engine SAA6D125E-6 Service(Shop) Manual. 236014 SAA6D125E-6A KOMATSU Diesel Engine SAA6D125E-6A Spare parts catalog. 236015 SAA6D125E-6B KOMATSU Diesel Engine SAA6D125E-6B Spare parts catalog. 236016 SAA6D125E-6C KOMATSU Diesel Engine SAA6D125E-6C Spare parts catalog. 236017 TP125S-1 KOMATSU Diesel Engine TP125S-1 Service(Shop) Manual.